Whenever I design a new pattern it’s always an effort on my end to whittle down the ideas. My brain goes a hundred miles an hour and I can always think of a dozen variations we could add. For our Jenny Overalls it was especially hard; when I drew up the technical drawings I had pages and pages of options, but in the end, we are limited to the number of pattern pieces we can fit on a tissue sheet and also not making the instruction booklet like a hundred pages long. 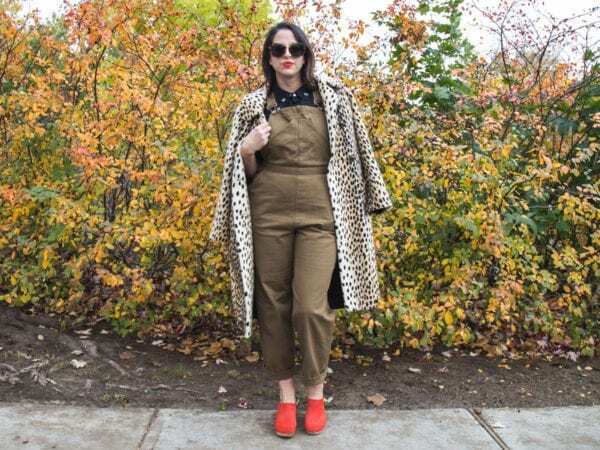 All of this to say, I really considered making these center button front overalls one of the options until I reined myself in at the last minute. I couldn’t get the idea out of my head though, so when I made myself a pair and realized how deeeeeelightful they were, we decided to create a free pattern bonus for you to do the same. Today I’m going to talk about the pair I made myself, and on Thursday we’ll be sharing the pattern pieces and tutorial. Okay, so how are these different from the original pattern? First of all, I split the bib in half and added a fold over facing to act as a button band. The fly becomes fully functional, the waistband opens in the front, and then the overalls can be taken on and off by unbuttoning the buttons. In lieu of the curved slash pockets, I drafted a patch pocket instead, which gives these a bit more of a utility vibe. Alex asked me yesterday if it was annoying to go pee while wearing them and honestly the answer is no. Once the buttonholes get worked in a little bit it takes 3 seconds to just unbutton the whole thing in one go, although you could also replace buttons with snaps, and then it would be even faster and you could feel like a basketball player in tearaway pants. Or a male stripper in a handyman uniform. Whatever floats your boat. I made these in a heavy-ish denim leftover from our last round of denim kits. I think it was a 12 oz? I love how structured they are – they make the wide leg feel very jaunty and intentional. I used a contrast gold topstitching, and antique brass buttons to match the overalls buckle (our hardware kits for Jenny include enough buttons for this version if you add the little button bonus). It occurs to me that you could also skip the buckle for a cleaner look and just sew the straps directly to the bib; I think that would make these feel more jumpsuit-y. Size-wise I made a 14 through the hip and leg, graded to a 12 at the waist/bust. Also, it’s very important to note that I LOVE THESE FIERCELY AND WITHOUT RESERVATION. I brought them to Europe and they were my most worn garment while I was gone. They feel very on-fashion, so it’s what I wore when I was shopping in fancy stores in Stockholm and wanted to look like I had money to spend and they shouldn’t get nervous about me pawing all the merchandise (does anyone else get sweaty in nice shops? Like, they will see through you and know you’re just there to take pictures of everything in the dressing room and have no intention of buying anything? I’ve learned over the years that wearing a cute outfit really helps with this fake shopping anxiety). I brought a few close fitting tees I would interchange, and dressed them up with wedge sandals or down with my Chuck Taylor hightops. I taught in them, went out in them, lazed around in the park in them. They are my favourite me-made garment right now and I’m excited to just beat them up and try to get a good fade going on the denim. Stay tuned on Thursday for the full tutorial and the free pattern bonus! I’m excited to give you another way to make this pattern your own.